Many high-risk website owners – especially startups on a budget, like independently owned e-juice merchants or FFL to FFL sites – are attracted to GoDaddy. It has an excellent reputation and is easy to use at a low cost. Making a website from scratch is no easy task, and finding cheap hosting is also getting harder and harder. As a result, GoDaddy can be a fit, but you will need to know how to set up the payment gateway and back-end credit card processing correctly. You’ll also need to tread carefully to make sure it all works smoothly. GoDaddy’s GoCentral sitebuilder is not a perfect fit for high-risk. At Tasker Payment Gateways, we’re here if you need any help at all. 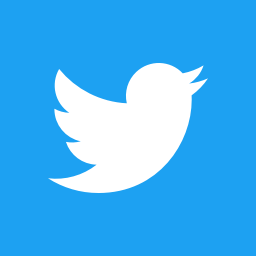 Whether you have questions or want expert help with setting it all up, just contact us here, or use our contact form at the bottom of this page, and we’ll get in touch as soon as possible. We like GoDaddy. 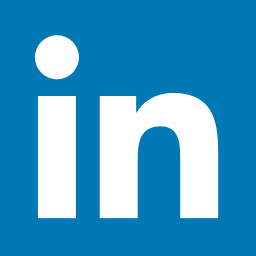 We’ve referred business to them in the past, and have helped their clients take advantage of the company’s vast array of products and features. Unfortunately, like many other shopping cart software suites that offer in-house (or closely referred) payment processing, GoDaddy has never had an “out of the box” solution for high-risk products and services. Their processing solutions, like most hosting providers and site builders, do not allow for many common high-risk product types. This isn’t necessarily a deal killer, but it does add complexity. This is what we do, we solve problems, and we love doing it. We help high-risk website owners find payment gateways, software, chargeback mitigation, and processing solutions that work with their shopping cart of choice. We’ll help even if that cart’s preferred partners don’t work in your industry. GoDaddy is a popular and useful choice when starting a website or for simple hosting needs. The website you build is usually free with hosting from GoDaddy, and GoDaddy can be set up with Authorize.Net. Unlike other payment processing solutions, like PayPal or Stripe, Authorize.Net allows you to charge credit cards for product categories that are commonly prohibited because it allows us to pair it with a specific, high-risk payment gateway on the back end. It’s one of our preferred high-risk payment gateways; you can read more about how to set up Authorize.Net with high-risk processing here. Off and on, for the past few, years we’ve had some real challenges with assisting high-risk clients in getting set up and accepting credit cards on their GoDaddy sites. This was the case years ago because GoDaddy’s preferred processing did not allow common high-risk product types like electronic cigarettes and FFL dealers, and they did not offer any third party options (like the options we recommend). We temporarily solved this problem a couple of years back. Our high-risk clients were able to process their sales based on the helpful information we relayed from an inside contact in the GoDaddy sales department. This information made it possible for us to enable our clients to prosper when using the GoDaddy site builder. It seemed to us at the time that the only real difference was that accepting credit card payments for high-risk products required the merchant to use a third party gateway processing combo like our Authorize.Net high-risk specific solution. This also meant that the merchant was expected to do most of the site building themselves, compared to the more one-on-one assistance GoDaddy otherwise provided. It was a solid solution for merchants who had committed to GoDaddy’s GoCentral (GoDaddy’s standard site builder) while looking to sell high-risk items. However, the old way of making high-risk sales work is no longer an option. This means that many high-risk business owners need a new way to sell their products while using GoDaddy. We know of no high-risk category restrictions on what legal products can and cannot be sold through their storefronts. This feature makes them an affordable option for merchants who are looking for the ease of setting up a site through GoDaddy with the high-risk friendliness of a properly set-up Authorize.Net payment gateway. However, times have changed a little even over the last nine months or so. The GoDaddy and Quick Shopping Cart combination was a crowd favorite as it had a handy drop-down menu, which integrated well with Authorize.Net. Considering our excellent track record of helping high-risk businesses with properly configured high-risk Authorize.Net accounts, it’s one of our preferred payment gateways for high-risk e-commerce. Unfortunately, according to their support staff, GoDaddy no longer offers the Quick Shopping Cart solution, which used to be the best route to sell high-risk products on GoDaddy sites. Considering this wide range of features that came with GoDaddy and their Quick Shopping Cart, it’s no wonder it was so popular. However, this combination doesn’t seem to exist anymore. The question for those who want to use GoDaddy then becomes: how can I sell high-risk products while using GoDaddy now that Quick Shopping Cart is no longer an option? It’s important to stress that the old way of selling high-risk products on GoDaddy, by using the Quick Shopping Cart, no longer works. However, it’s still possible to use GoDaddy to run a high-risk e-commerce site. The question then becomes how you decide to set up your site with GoDaddy, and how you can start selling your high-risk products using them. An important note here is that you should always review the terms and conditions of any site-builder you’re planning to use before committing to anything. You should also seek legal counsel before you sell high-risk or regulated products. There are two main ways that you can build your site with GoDaddy. The first is the extremely user-friendly GoCentral. 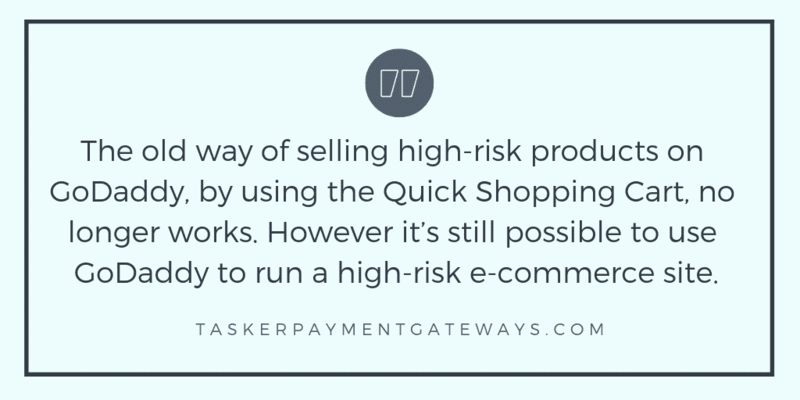 It gives you all the bells and whistles of a fully fledged e-commerce site, but it doesn’t automatically give you the high-risk processing options needed for a resource like Tasker Payment Gateways to help you sell online. What you’ll need to do is add a third-party feature that allows you to integrate a high-risk payment gateway. There is some evidence which indicates that you can use GoDaddy’s GoCentral to create your site and still add custom HTML and code to your site from third parties that would allow a buy now button. However, some restrictions and compatibility issues might pop up. This uncertainty made our team at Tasker Payment Gateways dig further. Best method: add a QuickClick buy now button URL to your site. You can add an NMI (Network Merchants.) “Quick Click” buy now button URL and link it to an image in GoCentral. The buy now button has an option to “view code,” which would be the URL. Then, you can add a button image in GoDaddy and link it to the NMI quick Click URL. You can watch a brief tutorial on QuickClick here. 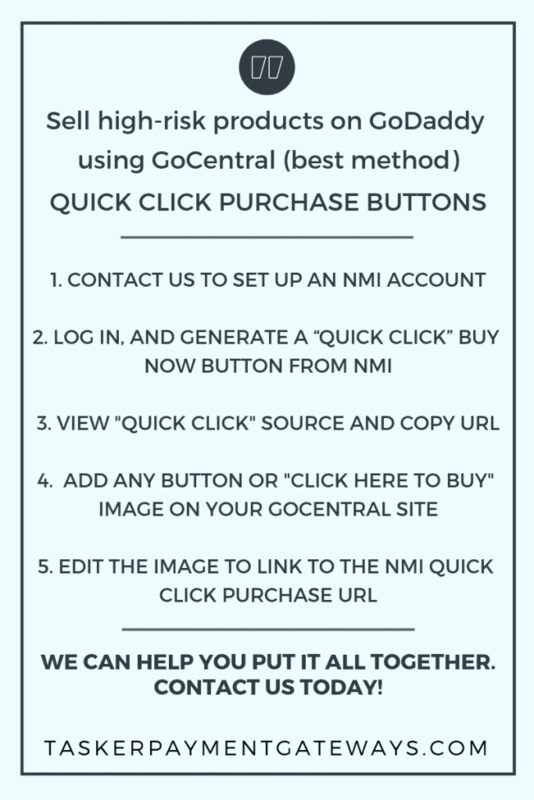 Once we set you up with the NMI gateway, you can log in, go to Quick Click, and select “Generate Button,” link the URL to a button or buy now image, and that should do it. There are limitations, and this is not a full-fledged cart, but it can work well for simple offers. Contact us any time to get started. We contacted GoDaddy and talked to one of their representatives to discuss whether third-party HTML, like the customized buy now button from Shopify, would work through the GoCentral site builder. This is where the GoDaddy representative suggested adding the buy now Button differently. He proposed starting the process with GoDaddy the usual way, and then choose the WordPress Managed site-builder. He recommended that it was a better alternative than GoCentral. You should know that a customized buy now button from Shopify isn’t the smoothest of solutions. You can create unique buttons for each product or service you offer. However, if you change your prices or products, you’ll need to manually change the buttons themselves. It does require some skill, but it will work. Additionally, you’ll still need to integrate this with the Authorize.Net payment gateway to make everything work as it should. Using GoDaddy and managed WordPress will, in practice, make the functionalities and customizations of your site practically identical to any other WordPress site. In other words, with GoDaddy’s Managed WordPress solution, you’ll be able to add code and HTML in a relatively straightforward way. However, it must be said that this route does require a little more expertise. If you need any help, don’t hesitate to reach out to us. To us, the buy now button GoDaddy suggests for their managed WordPress seems inelegant. Our question is, if you end up using a managed WordPress site instead of the GoDaddy site builder, why not just set up a WooCommerce store? Are you feeling overwhelmed? We’re more than happy to lend you a hand where needed and help you set up your payment gateway and high-risk payment solutions. 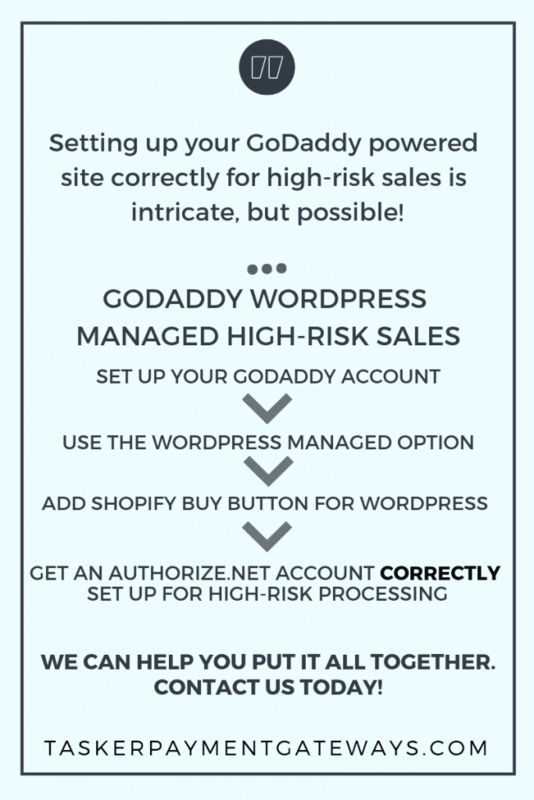 While it’s still possible to sell various high-risk products (like vape, FFL, or tactical products) using GoDaddy via a buy now button, this does require quite a workaround. It’s not the easiest way to sell high-risk products online. This is why we want to at least float some alternatives should you wish to check other ways that you can sell your products. Alternatively, as mentioned above, you could go the route of using WordPress and use the WooCommerce plugin. This combination offers a great deal of freedom while giving you the tools you need to successfully sell and manage high-risk products. It might be a less cluttered route than using GoDaddy and its WordPress Managed solution. It’s important to mention that depending on your industry (online cigar, FFL, vape, etc.) we will recommend that you connect a specific processor to the Authorize.Net gateway, and our preferred partners and independent agents will set it all up for you. Contact us first before getting too far down the line with this process. We can’t stress enough that you should review the terms and conditions of the site-builder you’re using before committing to anything. At the same time, you should seek the help of an attorney before you start selling regulated products. Remember to make sure you know the local, state and federal laws regarding the sales of regulated merchandise. Feel free to contact us with any questions or for a payment gateway recommendation, with no obligation to sign up – or pay for anything! Contact us using the form below to start selling your product or service right away.